My mother always prepared few chappaties and asked us to start eating while she continued making more chappaties for all of us. Like all mothers, she always ate in the end. Why do mom's do that, I still wonder sometimes ! I remember we used to fight for garam garam roti. Sometimes, my brother would even leave the table and go and sit at the kitchen counter so he could take all the garam (hot) phulkas (Chappati) first. And you know, that roti had something special. We could eat so many. Like all mothers, my mother too would have that proud and fulfilling look on her face when we enjoyed food and ate many chappaties. When I grew up, sometimes my mother would ask me to make chappaties for dinner. Oh! I used to be panicky because everybody loved garam chappaties and I would have to make so many. I used to ask everyone "how many you want to eat?" and my mother would get really upset. Sometimes so mad that she would even ask me to leave the kitchen. At that time I never really understood her anger. Now as a mother, I can relate to it and understand why a woman is called "Annapurna". It is really gratifying to see your child or children eat well so they can grow both physically and mentally. Not only you fulfill your duty as a parent but also serve community by providing healthy and strong future. For everyday cooking this is the basic type of dough. 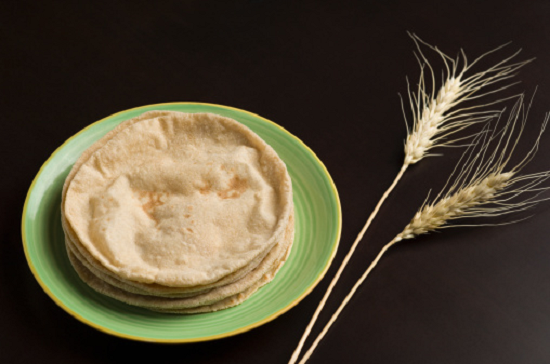 For chappati as well as Parantha, mix flour with water and knead for just one minute. Make a thick roll and pat little water. Cover and let it stand for 15 minutes. Now knead again for two minutes and you are done. Make a big roll again. Lightly brush oil in a container to avoid sticking and put dough in it. Store it in refrigerator where it can last for three days. Traditionally, chappati is cooked on Tava (hot iron plate) but it can be cooked on a nonstick round griddle as well. For best results, take the dough out from fridge 10 minutes before rolling. You don't have to press hard when it is soft. Sometimes, if I am in rush and the dough is stiff, I put it in microwave for 15 seconds. Then it becomes much easier to roll. Keep few spoons of dry wheat flour in a flat container with you when ready to roll. Make lemon-sized ball and put it in dry flour container. Press and flatten the ball with the help of a little dry flour. Roll it on a board with a rolling-pin into a thin round pancake. Carefully remove from the board and place on hot Tava. When the top uncooked side starts looking light brown, turn over and cook the other side well. My mother always flipped with hand. I use plastic spatula to change sides. When brown-black spots appear on the second side, then flip it one more time and press chappati with spatula or kitchen towel. The chappati will swell. Quickly remove it from Tava. Serve hot without ghee or spread a little ghee on the swollen side and serve Hot. Until I got married and moved to U.S., I used to eat Parantha every morning for breakfast. If you are Punjabi and like me, you can probably relate to it. We were never conscious we will put on extra weight by eating so much "desi ghee". My mother made paranthas practically from all vegetables. You name it and we ate it. From potatoes, cauliflower, cabbage, spinach, onions, carrots, radish, paneer, malai, beetroot, methi, jaggery, Dal-sprouts to all the other cooked leftovers and rice. We never got bored of eating the same thing. In fact, we looked forward to it every morning. Our appetite for paranthas never slowed down. I have eaten paranthas everywhere but I tell you my mother makes the best paranthas in the whole wide world. And this compliment is not because I am her daughter. It really is true. Of course, preparing filling and rolling Parantha is a skill that can be mastered over a period of time and anyone interested in learning can make good Parantha but I still feel that there is something unique and different in each person's preparation. Each and every Parantha made by my mother swelled like a simple plain roti. We all left at different time in the morning but none of us ever got a Parantha made in advance. My mother used to watch as to what stage of dressing up we are in and would go to kitchen and make our breakfast accordingly. If sometimes, she miscalculated or we started doing something after we got ready, she would scream and call us until we left everything and went to the table to eat her Parantha. As a rule, 1 medium potato will make 1 Parantha. To make filling, put peeled potatoes, onion, ginger, salt, chili powder, ground pomegranate seeds and garam masala in a bowl. Press potatoes with your hands and mix well with all other ingredients. Make 5-6 equal portions of the filling. The taste of Parantha depends on the amount of filling. When ready to eat, Heat Tava and make a ball from dough. Roll out thickly, just a little larger than puri. Place filling in the center and close up carefully by bringing all edges together and making a ball again. Now roll into the ball and roll out as thin as possible without letting the stuffing break through. Toss Parantha on Tava and cook. Change side. When cooked, flip over again. Now tap ghee lightly and flip one more time.. Press Parantha gently with your kitchen towel. This will make Parantha crisp and brown. Remove from Tava and put ¼ tsp. ghee on Parantha and serve hot. Repeat procedure until finished. Mix all ingredients and knead for 2 minutes. Make a big roll, cover, and let it stand for 15 minutes. Tapping a little water, knead dough again for 3 minutes. Make a big roll again.